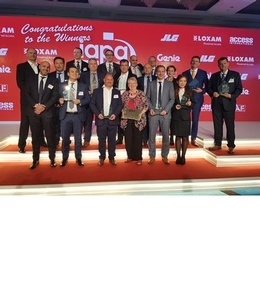 Dubai played host to the crème-de-la-crème of the powered access industry last month, when almost 350 industry professionals gathered to honour the winners of this year’s International Awards for Powered Access (IAPAs). Jointly organised by Access International and IPAF, the IAPAs celebrate best practice and excellence in the powered access industry, and this was the first time the event was held in the Middle East. Those assembled at the Radisson Blu Deira Creek Hotel were also the first to learn the next edition of the awards ceremony will be returning to the UK for the first time since 2017 and will be held in London on 23 April 2020. Facelift sponsored the Access Photo of the Year award, which was won by Santeri Karenen from Finland. His winning submission shows technicians from Bladefence using two 104-metre Bronto Skylift S104HLA truck mounts, belonging to rental company Janneniska, to inspect turbine blades at a height of 98 metres on a job in southern Finland. Other winners on the night included Bronto Skylift for its S35EM truck, JLG Industries in the US for its pioneering work in creating BIM models of mobile elevating work platforms and Skyjack in Canada for its ‘Elevate On App’, which enables paperless working onsite.